Kotak Securities Limited, a subsidiary of Kotak Mahindra Bank has launched a ‘Free Intraday Trading’ offer that enables investor the freedom from brokerage on intraday trades across cash, future and options segments at an annual subscription of Rs. 999. It is really a big move by a traditional broker like Kotak Securities to cut down the cost for intraday trading for its client. To point out, discount brokers like Zerodha, Fyers & Upstox are providing free brokerage on delivery trades. To compete and to stop migration of clients from traditional brokers to discount brokers, Kotak Securities has come up with free intraday trading. 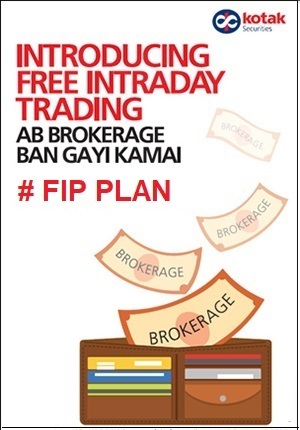 All Indian resident individuals having online trading account can opt for FIP (Free Intraday Trading) Plan. It is also known as Rs 999 Unlimited Trading Plan. Clients will be provided access to Research recommendation. The product is valid only for self-generated intraday order in Cash & Equity Derivative segments. A Self-generated intraday order is one in which both the buy and sell leg order are placed by the client directly on the trading platform provided by Kotak Securities Ltd. It is highly adviced to understand the specific terms and conditions around the plan before you actually pay and sign up for it. An annual fee will be charged at the time of opening the account or activating the product. This is an auto - renewal product. It will be auto renewed at the expiry of tenure of original subscription unless it is unsubscribed. Upfront subscription charges will be levied annually post the end of agreed subscription period. Failure to pay the annual fee plus applicable taxes within 30 days of charging shall disqualify the client from availing this product. b) Futures & Options Segment at the underlying-Expiry contract level. c) In addition, all statutory & other charges shall be charged as applicable. Brokerage rates applicable at the time of expiry or un-subscription of FIT services will remain unchanged. Benefit of Free Intraday Trading will discontinue upon such expiry Or Un-subscription. In case of discontinuation / transfer of plan / change in brokerage charges / closure (by the clients) / suspension / termination, the product fees plus applicable taxes will NOT be reversed in full or part. Position which gets squared off through expiry/exercise or assignment of contracts on the same day, will be considered as client traded & this will be treated as eligible client self-generated intraday order. Liquidation of positions for meeting margin deficiencies by Kotak Securities Ltd shall not be considered as self-generated intraday order by client. Volume generated under Free Intraday Trading plan (FIT) will not be clubbed with all other offer/plan. Kotak FIP is a step towards offering low-cost trading services to the price-sensitive trading community in India. Though this plan looks good, traders would show intrest to open account with discount brokers only as they offer competative brokerage charges across all trading segements with powerful and free trading platform. Traders who are looking only for intraday trading and need of some assistance in research and tips Kotak FIP is worth a try. Let us know your thoughts in the comments section below.